Summer 2016 - My, how times have changed! Download a campfire permit online. Found this sign at Snake Lake Campground, near Quincy, CA. Lots of great camping spots in Plumas National Forest. Yosemite foothills, Redinger Lake does not allow campfires, due to extreme wildfire danger: low elevation, dry hills and remote location. California suffers numerous wildfires every year. Please don't be the cause of one; You can be held legally liable for any unattended fire, or wildfire that you cause. Campfire permits are issued at no charge to insure fire restrictions are followed correctly. Southern California regions are very strict on fire permits. Please contact the forest rangers directly for regulations. This permit is good for stoves, fuel lanterns or campfires. Visit a ranger station; show your drivers license to a ranger & they can issue you a permit after you have reviewed the precautions & fire safety laws. Campfire permit is valid from the date issued until the end of the calendar year. 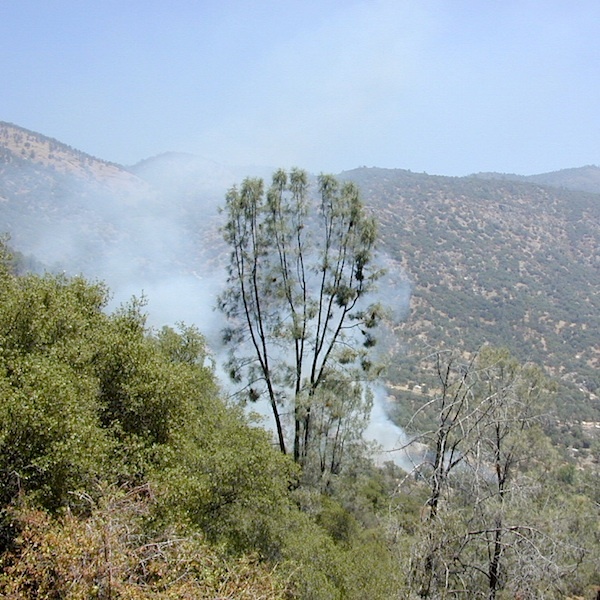 It may be used in any National Forest in Northern California or in the Sierra Nevada. See fire safety page. Most National Forest permit camping outside of developed campgrounds, except for Southern California, where wild fire danger is greatest. Campers must always have a camp fire permit if planning on burning a campfire outside of a campground. Always double check with ranger to make sure on fire restrictions, and IF CAMPFIRES are even permitted. During dry drought years of extreme wildfire danger, entire forests may ban campfires entirely, even inside regular campgrounds. Must ALWAYS have a campfire permit when camping outside a developed campground. Agreement to follow the campfire restrictions & regulations in effect. May be used in any National Forest in Northern California or in the Sierra Nevada. At camp have shovel, water source & bucket. Fire restrictions change throughout the year depending on fire hazard. When no stage restrictions are in effect, you may use a stove, lantern, or campfire in accordance with the regulations listed on your permit. 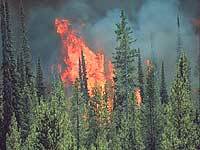 Fire hazard is determined by the fuel moisture content in an area (the amount of moisture present in the surrounding trees and brush) and by local weather patterns, which include the temperature, the prevailing winds, and the relative humidity. Sometimes a wilderness permit serves as your fire permit. Other Wilderness area regulations may require you to have both a fire permit and a wilderness permit. In wilderness areas where no Wilderness permit is requied, you must always have a campfire permit to use a backpack stove or build a fire. 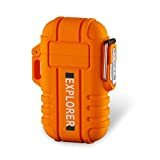 will let you camp almost anywhere, but does not allow ground fires. Use a metal container or fire pit & carry your ashes home. 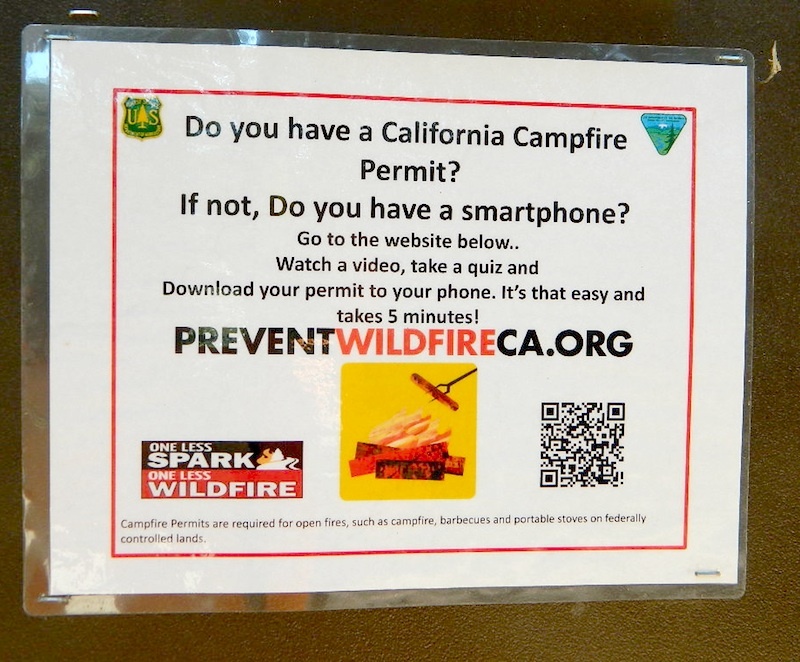 Your campfire permit can be obtained in person at a Forest Service office, California Department of Forestry and Fire Protection office, or Bureau of Land Management Office. Campfire permits are now issued online as well (see above for top image). You can renew a previous permit in person or online. No more renewals by mail.